gCLUTO (Graphical CLUstering TOolkit) is a graphical front-end for the CLUTO data clustering library. Its purpose is to make CLUTO's clustering abilities available in a user-friendly and graphical way. In addition, gCLUTO provides several ways to interactively visualize clustered results. A copy of gCLUTO can be found at http://www.cs.umn.edu/~mrasmus/gcluto. For more information about CLUTO visit http://www.cs.umn.edu/~karypis/cluto. Project tree that manages data files, clustering solutions, and visualizations. Note: the actual executables (gcluto, gcluto.exe) must stay within their folders in order to work properly. Do not relocate them. gCLUTO locates its supporting files (icons, images, etc.) by directory paths relative to the executable's location. Relocation of the executable can cause these files to not load properly. Matrix Visualization - This is a visualization that can be generated after clustering. 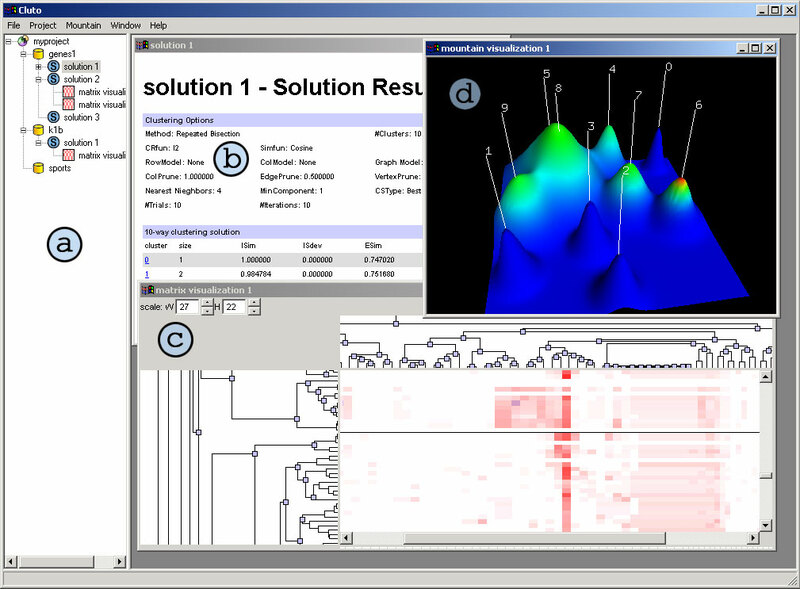 All visualizations appear under the solutions from which they were generated. 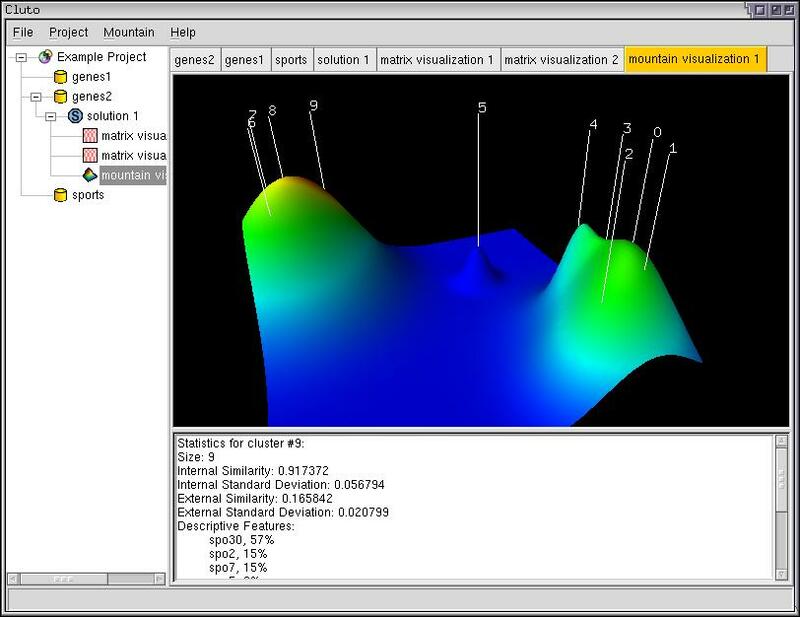 Mountain Visualization - This is another visualization that attempts to describe the interrelationships of clusters in a 3D way. Right clicking on any item will bring up a pop-up menu listing the available operations that can be preformed on the item. Double clicking on any item will open its contents in a new window called a view, similar to the windows (b), (c), and (d) in Figure 3.1. While working in one of these views, extra menu options specific to the view's content will appear in the menu bar. row labels (*.rlabel) - contains labels for the rows of the data matrix. Delimited files can be created by hand or exported by most spreadsheet programs. gCLUTO can accept tab, space, semicolon, and comma delimited files. Other characters can also be specified as delimiters. If the *.mat file is chosen first, gCLUTO will try to guess the location of the optional files (*.rlabel, *.clabel, *.rclass) by appending the appropriate extension onto the *.mat filename. For example, for a file named genes.mat, gCLUTO will guess genes.mat.rlabel for a row label file. If such a file exists, gCLUTO will make it the default file to open in the "Browse" file dialog. Using this file naming convention can simplify the importing process. If the user chooses to import a delimited file, the delimited file options will become enabled. gCLUTO can optionally interpret the first row in the delimited file as column labels. In addition, gCLUTO can optionally interpret the first column as row labels. User may also specify which characters should be used as delimiters. If multiple characters are specified, then the occurrence of any one of them will cause a field delimitation. Blank fields (two delimiters with no data in between) are allowed in delimited files. If a blank occurs where a number is expected, then it will be interpreted as a zero. If a blank occurs where a label is expected, then a default label of "no-label" will be used. After choosing "Cluster" in either menu, a Clustering Options dialog will appear with all the options available for clustering. These options work exactly the same as in CLUTO. For an explanation of their meanings see CLUTO's documentation. Only particular options make sense together. To help make sensible choices, gCLUTO will automatically update the dialog as the user makes choices to ensure that only reasonable choices are available. gCLUTO can now import clustering solutions derived from external sources. To apply such a clustering to a dataset in gCLUTO, choose the "External" clustering method in the Clustering Options Dialog and click "Cluster". This will prompt a Open File Dialog where the user can specify a Patition Vector file. A Partition Vector file is an ASCII text file that specifies a partitioning. For an explanation of the file format see solution export format in section 3.7. Once the clustering options are chosen, click "Cluster" in the Clustering Options dialog. After gCLUTO finishes the clustering calculations, it will respond by creating a solution item under the clustered data item in the project tree. The Solution Grid and the Data Grid to its left are designed to work together. Thus, scrolling vertically in either grid will cause the other to also scroll. Row resizing is also synchronized between the two grids. Horizontal scrolling is done independently in order to allow comparisons to be made between any column in the Data Grid and any column in the Solution Grid. NOTE: Tree building of large datasets can have large run-time and memory requirements. If the Matrix Visualization generation is taking too long, try disabling tree generation. To help explore the information contained within the Matrix Visualization, several features have been implemented. First, the size of the matrix can be scaled in multiple ways. Second, the trees can be used to collapse and expand areas of interest within the matrix. Lastly, the user can access information about any cell by clicking the right mouse button on cells. 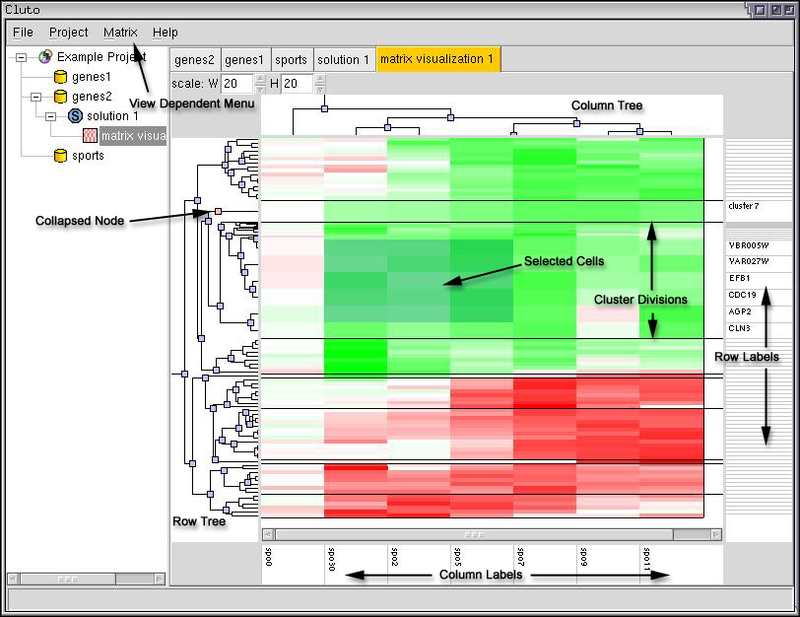 A pop-up dialog box will appear giving the row and column labels, the data value, and cluster id associated with the cell. Often times the user needs to enlarge one area of the matrix, yet shrink areas that are not as important. This type of scaling can also be done. To resize only a portion of the matrix, start by selecting the area to be resized. Selection is performed by clicking on any cell and draging the mouse to another cell. These two cells will become the corners of the selected rectangular region. Cells that are selected are shaded blue. To resize the selected region, place the mouse over any edge of the region. The cursor will change to a resizing cursor. Click and drag the edge to the desired location. The selected cells will then resize to fit within the new region. The "View Only Clusters" option is convenient for large datasets that are difficult to view when every row is displayed. Cluster averages also help depict the general trends present in each cluster. When printing the Matrix Visualization, the matrix is scaled to fit the entire Printable Area. Relative scaling of rows and columns is left intact. If labels or trees are present, they are each allocated roughly one sixth of the width of the Printable Area. Data Views are exported as tab delimited files containing the data matrix as well as any solution columns that are present. Row and column labels are also included in the first column and row, respectively. If labels are not given, then default labels "rowX" and "colX" are used, where "X" is replaced by the row or column number. Tab delimited files can be opened by most spreadsheet programs. Solution Views can be exported as HTML files or Partition Vectors stored in ASCII text format. The HTML files will contain the same information that is present in the Solution Report. This makes it easier to use and share the information given in Solution Reports. Web browsers and most word processors can open HTML files. 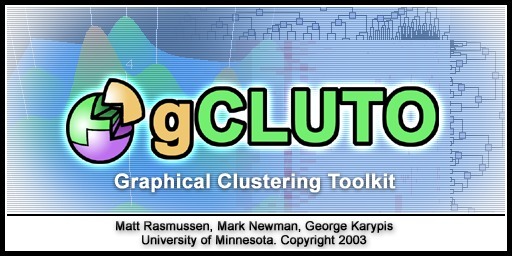 The Partition Vector format allows gCLUTO's clusterings to be easily used in further analysis outside the software package. The format is an ASCII text file with a signle column of integers in the range 0 to the number of clusters minus one. The integer on the ith line of the parition vector specifies the cluster id of ith object in the dataset. Partition vectors can also be imported by gCLUTO in the cluster options dialog.